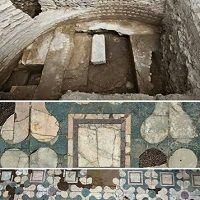 Did Electrical Workers Just Find A Church From The Dawn Of Christianity? Technicians laying cable near the Ponte Milvio came across ruins of four rooms from the first and fourth centuries. One of those rooms has carefully wrought floors of multi-colored marble and is adjacent to a small cemetery, which leads the supervising archaeologist to think that the site may have been a place of worship.